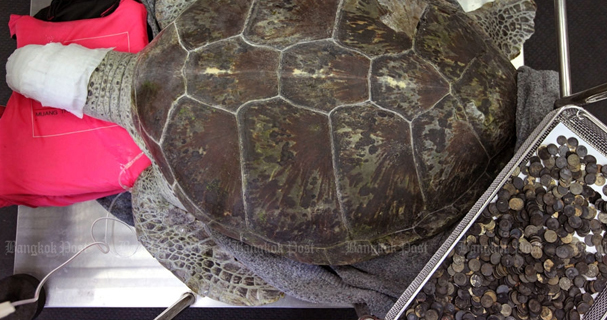 Veterinarians were shocked to operate on a sea turtle in Thailand after it swallowed 915 coins that weighed over 5 kilograms. Pasakorn Brikshavana of Chulalongkorn University’s Faculty of Veterinary Science, together with other veterinary doctors spent 7 hours in the operating room to remove the foreign objects ingested by the sea creature. Om Sin, Thai for “piggy bank”, was sent last month from the Sea Turtle Conservation Center of the Royal Thai Navy in Sattahip District in Chonburi after the said turtle could even barely swim. A CT scan showed that kilos of coins were stuck inside the turtle that gave it chronic stomach ache. According to Thai belief, throwing coins into a turtle’s pond would stop bad luck. Veterinarians were required to create a bigger cut due to the shocking discovery of the ingested coins.